Audio House is celebrating its 26th Anniversary with some exciting deals and promotions, as well as price matching if customers can find prices lower elsewhere at competitor stores. Apart from matching prices, Audio House will be offering an additional $26 rebate for every $100 spent in store during the birthday celebration period. These rebates are in the form of Audio House vouchers, with each valued at $26. This $26 voucher has its own T&Cs though. Each $26 voucher can be used for every subsequent $100 spent on following purchases. Subsequent purchases with the vouchers would not earn a further $26 rebate. 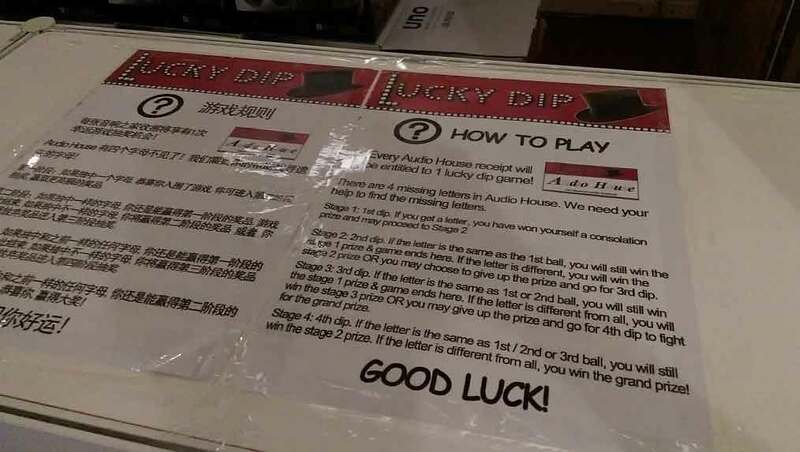 Let’s say you intend to buy 2 items from Audio House, with both being a $100 each. For the first item, you would pay $100, and receive a $26 voucher in return. You use this voucher for the next purchase, and fork out $74 for the second item. The effective discount is 13%, which is still good, especially since some of the offer prices are quite attractive. However, in most cases, prices don’t end in such nice whole numbers so the effective discount rate will be less. This voucher system is a little more troublesome compared to an upfront discount, but will be rewarding if you plan to get multiple items. It’s also a little better compared to previous Audio House promotions where the rebate was tagged to example a 4D number, or the winning World Cup team. No one really wants to jump through so many hoops for a discount. Do shop around, and also make use of the price match mechanism. The current brochure deals are available here – Audio House Facebook and future deals will be refreshed on a weekly basis. Besides what’s advertised, there’s also a number of LED TV display sets, across the different TV brands, which might be a good bargain too. I am going to start buying lots of home electronics equipment (fridge, heater, tv, washing machine) so some of the deals definitely caught my eye. Just that, I don’t want to buy them yet with my place not ready till a few more months (stand by for a slew of gadget-focused home renovation posts coming up!). If you head down to Audio House, do check out the longest Ultra High Definition (UHD) TV wall in Singapore. Audio House has one the widest range of UHD TVs on display, for you to scrutinize and compare every UHD pixel. The promotion is currently set to run from 24 October to 7 December 2015, which give you some time to plan your purchases. However, as with all these promotions, especially the star buys, all deals are on a first come serve basis, and are limited to one set per customer. Customers will also be entitled to a lucky dip, with four different stage of prizes. Stage 1: Mobile Accessories, Stage 2: Power bank, Stage 3: Air Fryer, Stage 4: LED TV. While it gets progressively harder, it’s worth trying out for at least Stage 3, since the first two prizes are really low value items.